Place asparagus and water in 8×8 inch microwave-safe dish and cover. Heat in microwave on high until tender, 6 to 7 minutes. Remove asparagus from dish and place in a single layer on the prepared baking sheet. 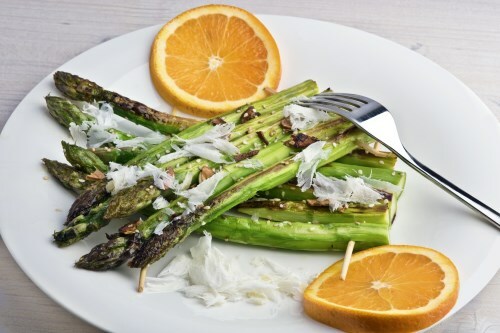 Squeeze lemon wedge into melted butter and drizzle over asparagus. Sprinkle Parmesan cheese and ground white pepper over asparagus. Place under broiler until lightly browned, about 2 minutes.